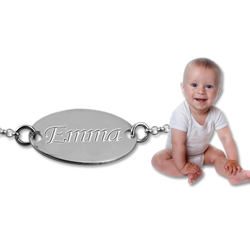 A delicate, oval-shaped sterling silver Baby's / Child's ID Bracelet, personalised with the name of your princess and completed with a fine rolo chain. So pretty! Available in three chain lengths. Please Note: The turn-around time for this sterling silver Baby/Child ID Bracelet is approximately 3 weeks.